Tis the season to be jolly! 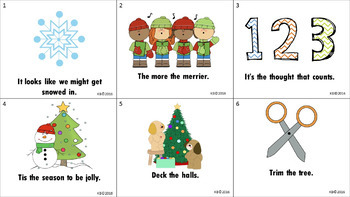 Here’s a simple, easy to use freebie to learn about those funny Christmas Holiday expressions! Simply print out the colorful cards, laminate (if you wish) and use for talking about idioms and figurative language for the holiday season. Try one a day as part of your English Language Arts instruction, or address multiple expressions in small group lessons. This freebie includes 18 cards with a separate answer key (giving simple explanations for the idioms).